The Russian Foreign Ministry also said in a statement that it is ordering the closure of the British Council, a government organization for cultural and scientific cooperation, and that it is ending an agreement to reopen the British consulate in St. Petersburg. The British Council on Saturday voiced deep disappointment after its activities in Russia were halted. "We are profoundly disappointed at this development," the group said in a statement. "It is our view that when political or diplomatic relations become difficult, cultural relations and educational opportunities are vital to maintain on-going dialogue between people and institutions." 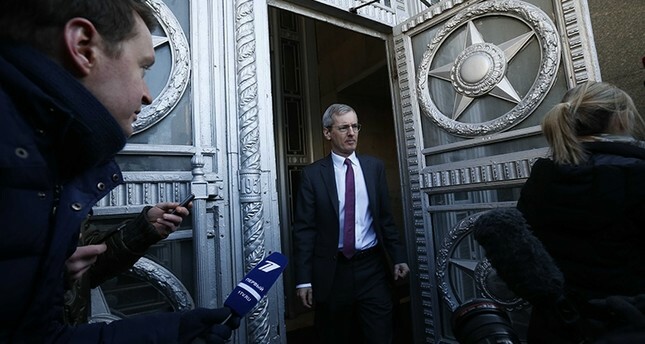 Russia's Foreign Ministry ordered the British diplomats to leave within a week. The statement said the government could take further measures if Britain takes any more "unfriendly" moves toward Russia. British Ambassador Laurie Bristow was called to the Foreign Ministry Saturday morning to be informed of the moves. British Prime Minister Theresa May this week expelled 23 Russian diplomats and severed high-level bilateral contacts over the March 4 poisoning of ex-spy Sergei Skripal and his daughter Yulia. They remain in critical condition in hospital. Britain's foreign secretary accused Russian President Vladimir Putin of personally ordering the poisoning of the Skripals, who were found slumped on a public bench in the southern English city of Salisbury. Putin's spokesman denounced the claim. Meanwhile new tensions have surfaced over the death this week of a London-based Russian businessman, Nikolai Glushkov. British police said Friday that he died from compression to the neck and opened a murder investigation. Russia also suspects foul play in Glushkov's death and opened its own inquiry Friday. British police said there is no apparent link between the attack on Glushkov and the poisoning of the Skripals, but both have raised alarm in the West at a time when Russia is increasingly assertive on the global stage and facing investigations over alleged interference in the Donald Trump's election as U.S. president. The source of the nerve agent — which Britain says is Soviet-made Novichok — is unclear, as is the way it was administered. Russia has demanded that Britain share samples collected by investigators.